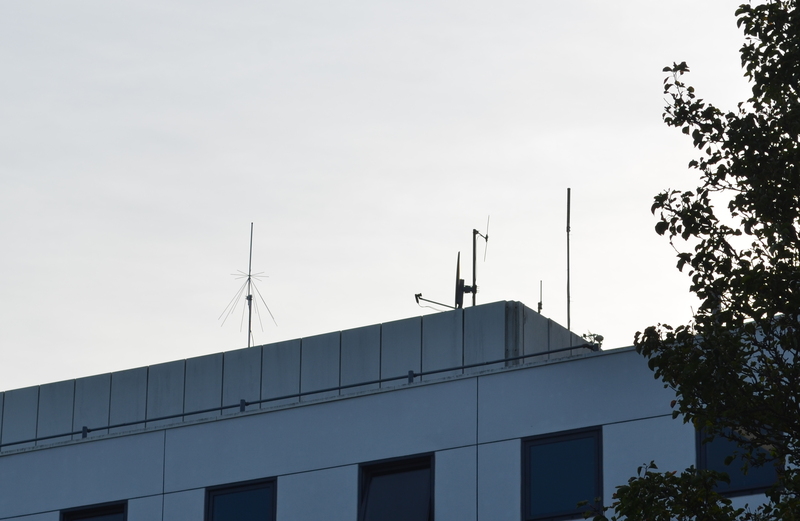 After nearly 2 years in the planning and development, the new SOWN Zepler has finally been deployed on the roof of Building 59 (a.k.a Zepler) to provide Wi-Fi coverage to the outside areas to the north of Highfield campus. The previous incarnation of SOWN Zepler had used a Soekris Net 4511 with a PCMCIA wireless card that could only provide Wi-Fi using the 802.11b protocol. This had been very much non-functional as a Wi-Fi access point for the last couple of years and was finally disconnected, when new power and networking was run to the roof of Building 59 in early 2017. The new SOWN Zepler has been equipped with considerably more modern components. The core of the base unit is an APU1C board that boasts a 1GHZ dual Bobcat core CPU, 2GB of RAM and three gigabit Ethernet ports. It also has two standard mini PCI express (miniPCIe) slots, for which we have connected 802.11n (2.4GHz) and 802.11ac (5GHz) Wi-Fi cards. Getting Wi-Fi cards to operate to their full potential in access point mode is often rather tricky. In the end, the 802.11ac Wi-Fi card used came out of an Archer C7, as we found it very difficult to obtain a standalone 802.11ac card that we could get working in access point mode. This posed an interesting problem, as this Wi-Fi card was oversized and therefore could not be installed directly in the miniPCIe card slot, as it would have obstructed the other slot. Therefore, we ended up buying a miniPCIe extender to allows us to mount the card off the board where it would not cause an obstruction. The main issue with getting Wi-Fi cards to behave like you want are the drivers. Therefore, to give yourself the best chance, the operating system you use is critical. After some investigation, we opted for Debian Linux 8.0 64-bit (Jessie). Another critical choice is the Linux kernel, which took some back and forth to find a revision that provided the best support for both Wi-Fi card drivers. The APU1C board’s default storage is an SD card. Past experience has taught us that this is not something you should rely on when access to the device it is installed in is limited. Fortunately, the APU1C board also has an mSATA miniPCIe slot. Therefore, we decided to install a 30GB mSATA disk. This is almost certainly more space than we will ever need but gives us a much more reliable storage device. SOWN Zepler was originally intended to only provide Wi-Fi using the RADIUS-based authentication for university staff and students, much like Eduroam but with a different SSID to avoid conflicts. However, the APU1C is a pretty powerful board, so suggestions were made for other functions it could provide. It was decided that it could make a good Web SDR. So we opted to purchase two NooElec NESDRs as the APU1C board had some USB ports that were not being used. 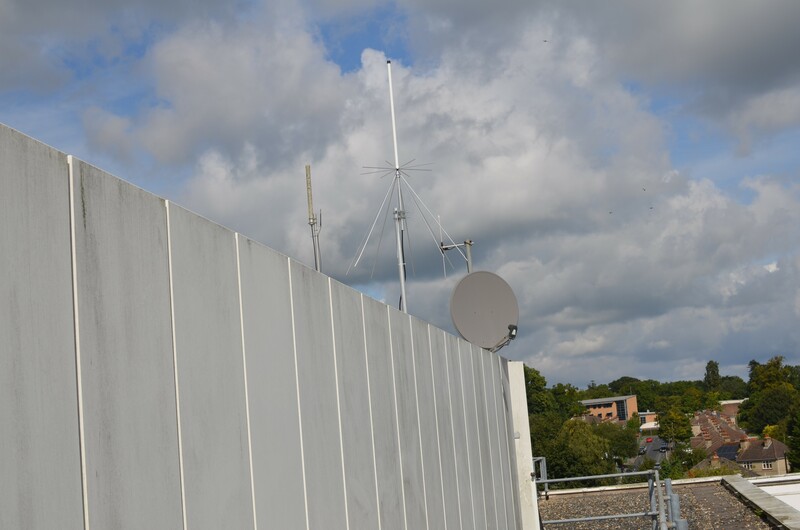 However, this then meant we needed to erect a new mast and antenna to give something for these devices to connect. By far the best antenna we already had for this was a Discone antenna, as it is capable of receiving a wide range of Amateur Radio bands. However, erecting such an antenna and mast assembly would add considerable time and effort to the installation of SOWN Zepler. Just after 10am on Tuesday 19th September, a team of five of us were finally able to gain access to the roof of Building 59 to install the new SOWN Zepler; after all the appropriate Health and Safety paperwork had been completed. The first task was to check that the mast and cables we had selected were of suitable lengths. It was essential the new mast was not higher than the current highest mast but still high enough for the spokes that form the ground plane of the Discone antenna to be clear of the metal walls of plant room on the roof. Although the mast was a little short, it could be supported on a ledge, before being secured to the plant room strut-work with three Jubilee clips, making it the perfect height. 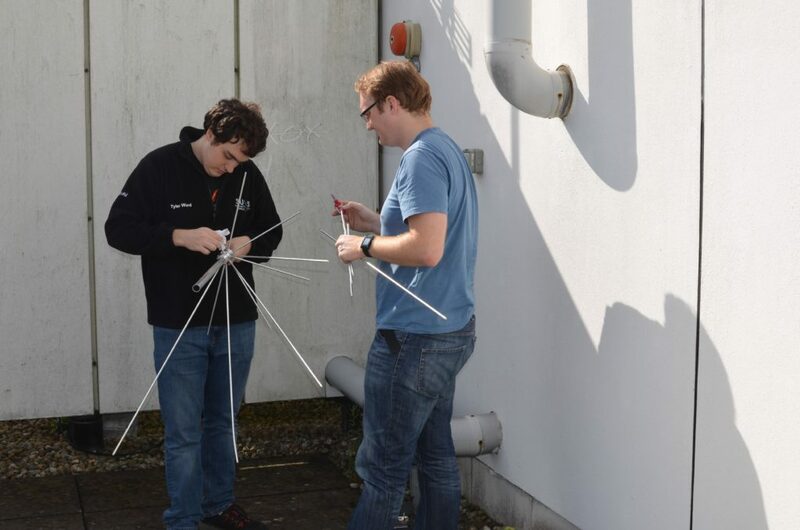 Before the mast could be secured into place the Discone antenna had to be assembled. This required inserting 16 spokes of various lengths to provide a ground plane. These are normally just screwed into place but we were concerned that continual buffeting from the wind would work them loose, so we decided to use some Loctite 222 thread-locker to ensure this could not happen. Tyler and Phil inserting the spokes into the Discone using Loctite 222 to ensure they don’t work loose. Once the Discone was assembled, it could be attached to the mast that we had passed over the plant room wall so we could attach the antenna in situ. 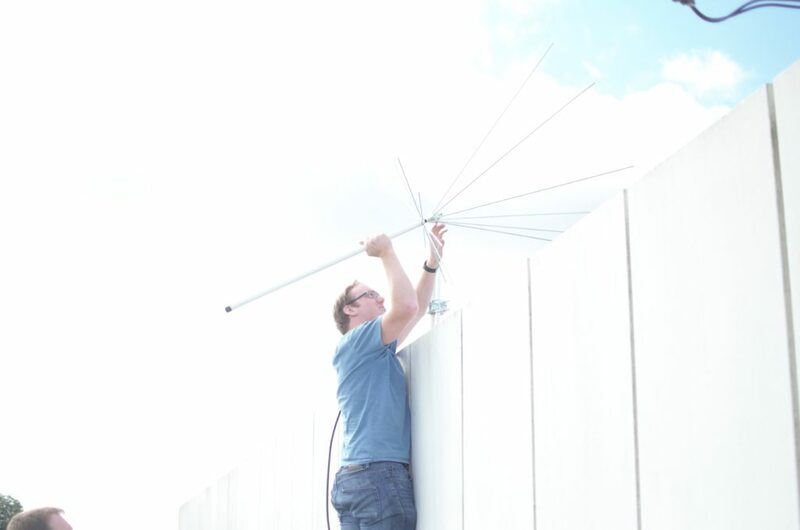 However, as this was too high for Phil to reach, we had to lower it back off its ledge whilst attaching the antenna. The Discone antenna has a PL259 connector but as we preferred using N-type cables because the connectors are sturdier and usually less lossy, we needed a PL259 to N-type converter attached to the antenna. As we did not know exactly what length of cable we would need, we ended up having to use two cables, fortunately one had both a male and female connector so we did not need an adapter to join them together. Phil raising the Discone into place before attaching it to the mast. After we had finished erecting the mast, we needed to install the base unit. The inside of the plant room on Building 59 roof has a standard Unistrut framework, so we could used some captive nuts and bolts to secure the mounting plate of the base unit to this. Once the base unit was securely in place we could attach the cables to the base unit, via some lightning arrestors that should ground any electric surges to earth and hopefully prevent any of our equipment getting damaged. 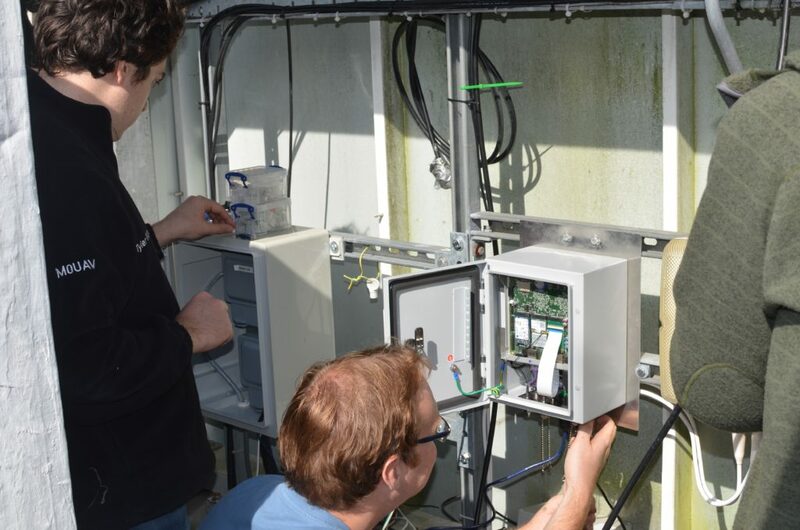 Tyler and Phil finish off the installation of the SOWN Zepler base unit. Unfortunately, after all this work we would have to wait a while before we could check that everything worked, as the network port that the base unit was connected did not support Power over Ethernet (PoE), so we needed to wait for it to be re-patched. 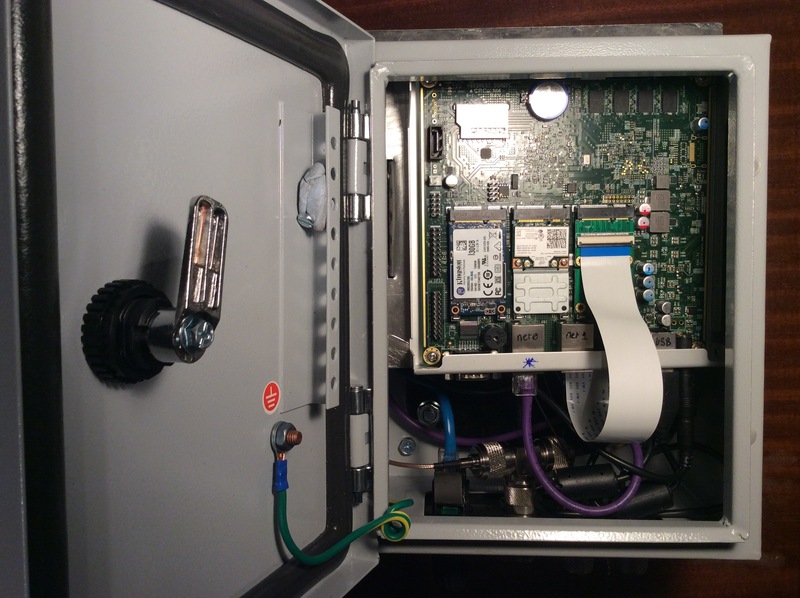 (Although APU1C does not support PoE, we decided to use a PoE splitter, so we only needed to worry about running Ethernet to the base unit). Fortunately, this did not take long to get sorted out and SOWN Zepler connected to the network for the first time just after 3pm on Friday 22nd September 2017. New Discone and 5GHz antenna for SOWN Zepler amongst other roof furniture. Although SOWN Zepler is now deployed, there is still a lot of work to be done to make use of its Wi-Fi and SDR capabilities. This is the ideal time of year for us to work on this, as we will hopefully soon have new student members from the 2017 intake, who can get involved in these projects. View of SOWN Zepler from the ground.